Giving Tuesday, Nov. 27, is known at the League as #GivingTREESday! I love #GivingTREESday! 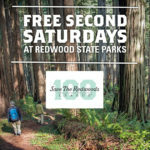 It’s a chance to see our community of redwoods supporters come together. And this year was no exception. Thanks to our dedicated members, we hit our $50,000 goal! Over 300 donors blew us away with their swift and generous response to reverse the harm done to the precious Grove of Titans – truly giving to these special trees. I’m in awe of their generosity. Those gifts will have triple the impact for the Grove of Titans thanks to our #GivingTREESday matching donors: Josie Merck, Arlin Weinberger, and Gary James. That means a total of $150,000 will go to help secure an environmentally sensitive visitor experience to be enjoyed for future generations. Thank you for helping us protect the Grove of Titans. To learn more about the Grove of Titans, visit our project page.